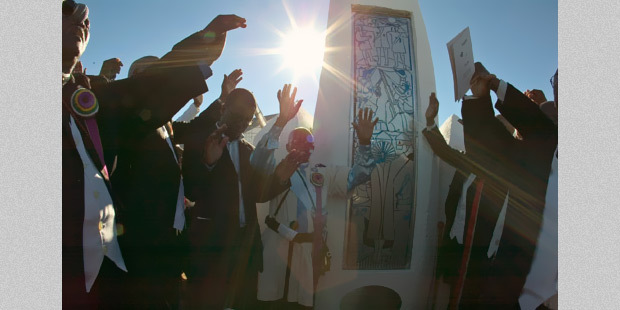 Members of the Church of God and Saints of Christ raise their spirits around the cenotaph created by Mgcineni Sobopha and Michael Barry to commemorate the Bulhoek Massacre. 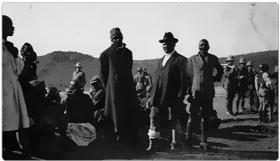 On May 24 1921, police killed at least 183 Israelites - followers of the prophet Enoch Mgijima - in a 20-minute battle at Bulhoek near Queenstown. About 500 white-robed men, armed with sticks and spears, challenged the machine guns of an 800-strong police force brought in to remove the Israelites who had settled at the holy village of Ntabelanga, or Bulhoek, to pray. Mgijima was charged with sedition and imprisoned. On his release in 1924, he and other survivors started building this tabernacle, where the massacre is commemorated annually by the Church of God and Saints of Christ, as the Israelites are now known. Three days before the Bulhoek Massacre, Colonel Theo Truter, the Commissioner of the South African Police, delivered an ultimatum to the Israelites: vacate your land or be dealt with "drastically". Find out more about Enoch Mgijima’s response to police threats of force; read, in his own hand, Mgijima’s rock-solid belief in his prophetic vision - a vision for which he was willing to sacrifice his life. Read how the South African Police amassed the biggest peacetime police contingent in anticipation of a confrontation, and the feeling on the ground about how a confrontation would teach the Israelites a lesson. Take a journey through the events on the day of the massacre through the eyes of the South African Police Commissioner, Theo Truter. Enoch Mgijima’s father was among those Mfengu people who accepted land from the British in a buffer zone - Ntabelanga, or Bulhoek. In a glass case in the Amathole Museum, a homemade sword stands as the symbol of a religious group’s struggle to protect its community. Who are Mgcineni Sobopha and Michael Barry? Sobopha lives in Alice, where he lectures in art history at the University of Fort Hare. Barry is the Eastern Cape project manager of the Sunday Times Heritage Project. Considering the story of Mgijima and how his followers are still thriving to this day, the two artists wanted his memorial to reflect strength and perseverance.